Well, we know what a pewter plate is, but a charger plate? Chargers are basically plate holders. They were used since the 19th century, and became popular toward the end of the last millennium. 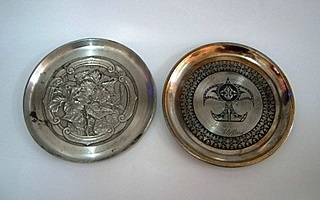 You might have seen pewter charger plates being used in some restaurants or at dinner parties and weddings. They are for decorative purposes only. Plates used to serve food are put on top of the chargers, so the latter are also referred to as underplates. You'll find that plates meant for use generally do not have any artwork in the middle. Any artwork is usually confined close to the outside. 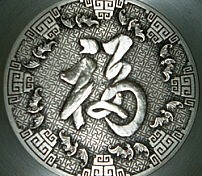 This one has an oriental theme, and the Chinese character in the middle means 'Prosperity'. It's a piece I like very much. Here's a closeup of the plate. You can see that the 'Prosperity' character is surrounded by bat motifs. 'Bat' in Chinese is pronounced the same way as 'prosperity', hence the association. These plates are relatively old modern pieces. I got them from a flea market. The one on the left has hibiscus motifs, while the other one shows the wau (pronounced as 'wow'), a kind of kite made and flown by the Malays in South East Asia. Both the hibiscus and wau are national symbols of Malaysia. 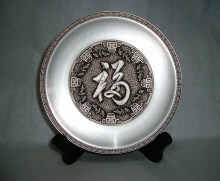 You can also check out other pewter tableware on this site.